Expert airport consultancy services, tailored to individual goals and capacity requirements. AiQ Consulting are holistic airport consultants who can deliver solutions at any stage of airport design or capacity planning. If there is a number to your challenge, we can calculate a solution. Our core team consists of engineers, airport planners, applied mathematicians and computer programmers. As well as providing support and solutions from a technical aspect, we also deliver decision support and stakeholder management throughout the process. We guide you and your team through evaluation and design, to a result that works for your airport. 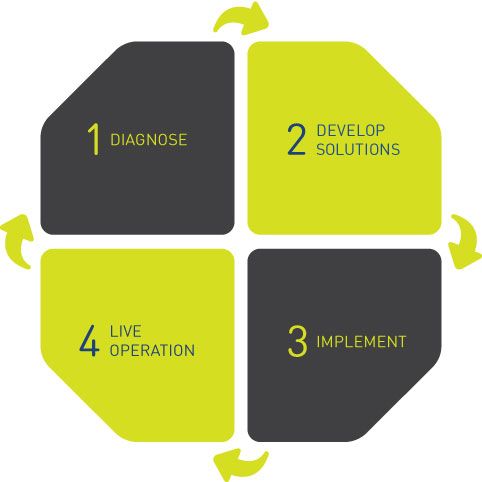 Solutions can be delivered at any stage outlined in our process model below, depending on the requirements and development stage. We generally begin by identifying current and future demand and capacity within your airport schedule, and then apply our skills to your unique problems. No airport is the same. Demographics, airlines, passengers all differ in every airport we have worked on. Even processes themselves can vary. We apply our knowledge and techniques to your airport as an individual entity. With this key service, we analyse the operations and airport layout to provide a capacity assessment for all areas of the airport and operations. This is the process of evaluating how efficiently an airport is used. We collate airport data, including schedules, passenger and baggage figures and more, in order to provide you with a holistic view of what is and isn’t working in your airport. This service looks at current and future demand, based on future flight schedules and the operational details of the airport. With the data we provide, clients can assess the need for new capacity for a passenger terminal, analyse airside vehicle activity or to create an overview of an entire airport’s operations. This ensures that our clients meet passenger demand, now and in the future. Typically using simulation software, this service determines the workflow, equipment needs, and implementation requirements for a particular process. Our expert planners, engineers and programmers work with your team to decide the right design and process for your airport. Planning and designing of new airports, as well as the restructuring or developing of existing airports, requires long term strategy and decision making support. AiQ Consulting have the skills and experience to deliver a clear framework for the later detailed design of either a new airport, or changes to an existing one. This service can also include analysis of noise level pollution and other environment concerns. Make your airport more cost effective by finding improvements to current processes. Our team have vast experience in analysing schedules, processes behaviour, and process behaviour to increase capacity and effectiveness. Respond to changing demand by reorganising and streamlining core airport processes with AiQ Consulting’s cost effective solutions for operational efficiency. This key service gives clients the opportunity to evaluate their airport design, or changes to it, in order to see whether it will deliver to their goals. This testing is aimed at ensuring the design delivers against the user needs and specified requirements. Using our bespoke simulation model and skilled team, we work with airports to run through changes to processes, architecture, design and more in order to ensure their changes work before they are implemented. Our bespoke simulation programme creates a complete holistic model of your airport to provide foundations and support for all of the services above. TransvisionAiR™ develops simulations that accurately model all processes and passenger and baggage flows throughout airports. It collates and includes data on flight schedules, airlines, handlers, vehicles, passengers and much more to provide a detailed analysis of your airport, and the impact of any changes on capacity and operational effectiveness. This simple visual animation allows your management team and stakeholders to grasp the impact of any changes effectively and to make decision making a clear, straightforward process. For a detailed account of how simulations can improve your airport’s design or capacity planning, read our GMR Hyderabad Case Study.